If BHP Billiton has rights, and can act as a legal person, why shouldn’t the Great Barrier Reef? What would change if we decided that the natural world we are part of had rights of its own – the right to exist, to habitat, to be free from pollution? This collection began its life as an exploration of the concept of Rights of Nature. However, in early research and conversations it swiftly became clear that it would be worthwhile setting this concept into the broader context of the suppression of human rights and civil and political rights. As it was frequently pointed out, there is little point establishing a new set of rights if existing rights are not being honoured. Worse, given ongoing anti-environmental framing, it could set up a counterproductive contest, with the new rights for nature being portrayed as subjugating human rights even further. The Ecological Democratic view, of course, understands humans as part of nature, and therefore understands that all these rights are intertwined and self-reinforcing rather than competing. Nevertheless, existing systems and structures of power will need to be re-imagined in order to make this ecological view a reality. In particular, the way in which corporations are enabled to act with impunity, with divine right, must be changed so as to enable the human and civil and political rights to be fully embraced and Rights of Nature to be introduced. The collection takes this question and examines it from several directions, with contributions from some of Australia’s leading thinkers and practitioners in their fields, including Michelle Maloney, Peter Burdon, John Quiggin and Nicola Paris. 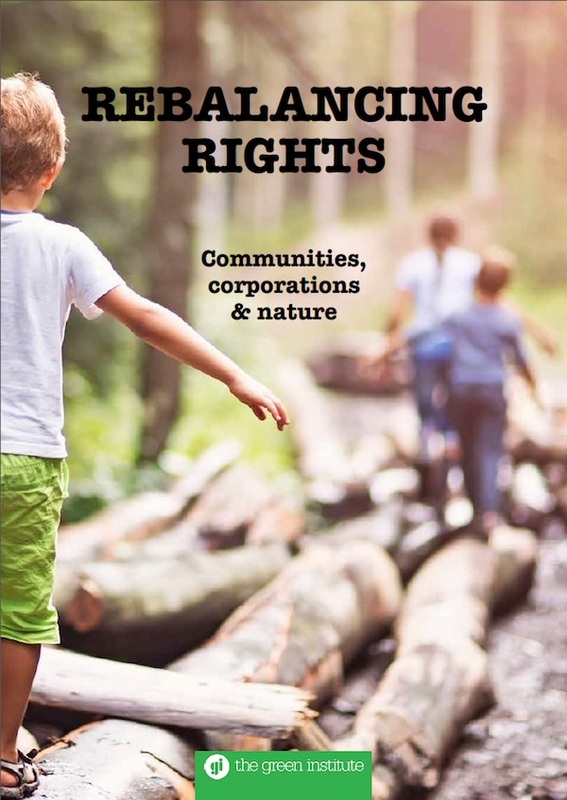 We have three contributions examining the question of Rights of Nature itself, two setting out the recent suppression of civil and political rights, and three examining ways in which corporations have come to dominate our society and politics and how to pull back their power. This is by no means a comprehensive examination of either the extent of the problems or the range of solutions, but it is by way of a challenge to our political discourse – that we must seek to build a system where human rights and Rights of Nature are the prime directives, if you will, and corporations exist to support those, not in competition with them. 1. Click on the link above or image below to view. 2. Right-click to SAVE the PDF file to your computer. 3. Right click to OPEN in a new tab or window to view. Email The Green Institute and we’ll send you a copy via email.